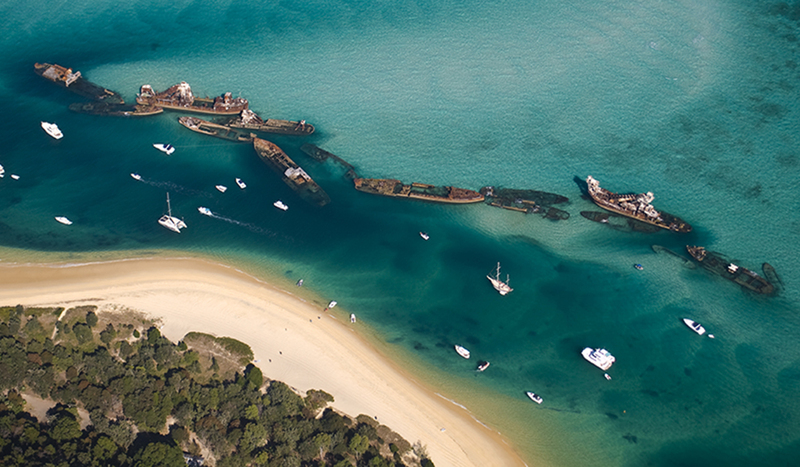 "Aerial view of the Tangalooma Wrecks at Moreton Island, Queensland, Australia"
With more than 50,000 kilometres of coastline, Australians are spoilt for choice when it comes to stunning oceanside locales. But beyond our world-class beaches, there’s a plethora of waterways to splash about in, from lakes to waterholes to man-made pools to waterfalls. It’s time to grab your cossie, because here’s a round-up of the best places to enjoy life by the water. This tiny island off the east coast of Tasmania was bought by its first owner to farm salmon and sheep, but more romantically to pursue his passion for painting and writing. When he passed, he left the remote island to some very lucky relatives who turned the original humble house into a luxurious holiday retreat. Now we’re the lucky ones: the whole of Satellite Island is available for guests to enjoy to themselves (with the exception of the discreet island manager and a lovely herd of deer). While you’re there: If cosying up in the beautifully styled house by the fireplace becomes wearisome, you can choose to sleep in the jetty shed, which has been converted into a plush room. It is a glorious spot to sleep any time of the year, but during the summer months you can dive straight off the jetty for a refreshing swim and push the roller doors up to snooze to the sound of lapping waves. 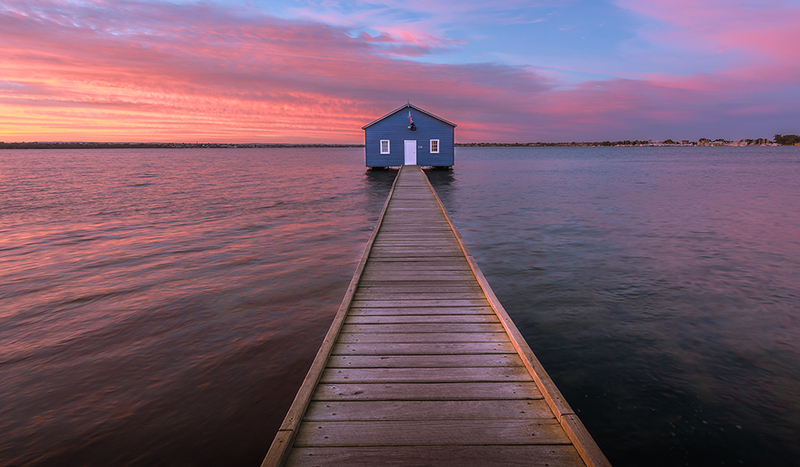 This attractive little boatshed, named Crawley Edge Boatshed, sits in Matilda Bay on Perth’s Swan River. Swimming here is a popular pastime, dating back to 1914 when the area was named Crawley Bay and the Crawley Baths were built. They were sadly demolished in 1964, but a bronze statue titled ‘Eliza’ was erected here to commemorate them. Today the Matilda Bay Reserve is a great place for cycling, swimming, rowing and picnicking. The boatshed was extensively refurbished in 2001 and is now one of the city’s most photographed structures. While you’re there: Keep an eye out for one of the resident bottlenose dolphins who call the river home. 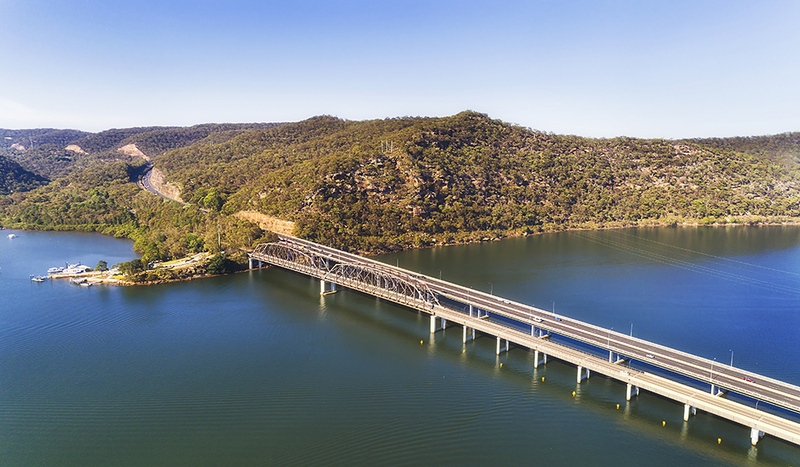 For many Sydneysiders, the Hawkesbury River is that pretty place you pass as you catch the train or drive to regions north of the city. But don’t just zoom on by. The Hawkesbury is a haven for adventure and nature lovers, with more than 70 per cent of the area being national parks (with great bushwalking and wildlife watching), five rivers and 17 small towns and villages to explore, including Dangar Island, a tranquil little hamlet, home to just 250 people. While you’re there: Another fabulous way to explore the area is by houseboat (try luxuryafloat.com); just bring your cossies, a kayak, a fishing rod and a book, for a completely relaxing break. Long, white sandy beach, turquoise water, hardly a soul around – all elements that see this beauty on many Best Beaches lists, including an extensive study of 10,000 Australian beaches by Sydney University, of which Vivonne Bay came out on top. 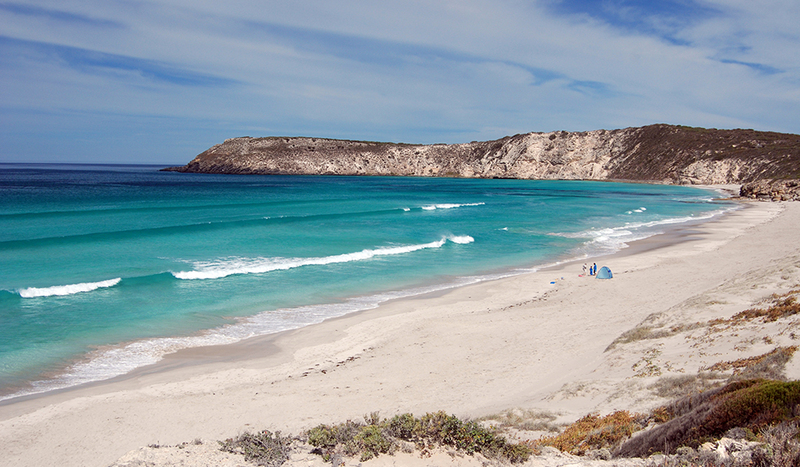 The only safe harbour on the south coast of Kangaroo Island, this beach is good for swimming, surfing and fishing from its jetty, which is often used by cray-fishermen to off-load their catch. While you’re there: To the east is Seal Bay Conservation Park, home to the third-largest sea lion colony in the country, so be sure to say ‘hi’ to these relatively friendly locals. 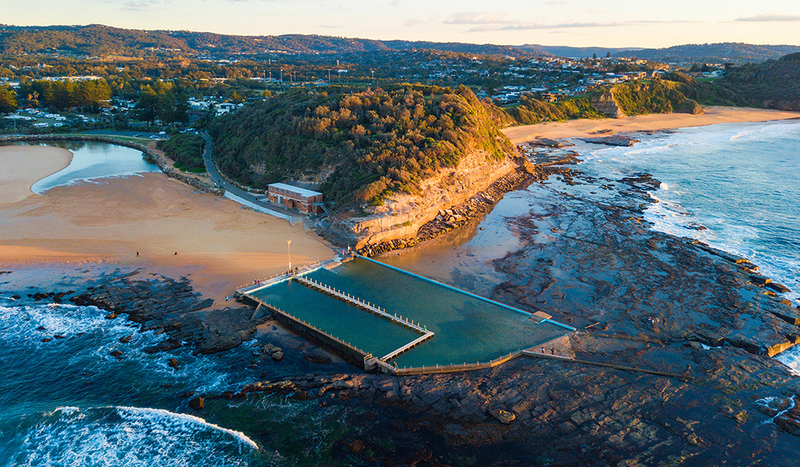 Built in the 1930s, this striking ocean pool is located at North Narrabeen on Sydney’s north shore. The 50-metre pool has a wooden boardwalk that separates the lap swimmers from those who just want to splash about, just as it did when it opened in 1934 (though it has been replaced a number of times since). While you’re there: bring your board! The surf is so good at North Narrabeen beach, it was declared a National Surfing Reserve in 2009. Even the Beach Boys wrote the beach into the lyrics of Surfin’ U.S.A – the only non-American beach mentioned! On the country’s south-west tip, between Margaret River and Augusta, lies Hamelin Bay, an area with fine white sand, turquoise water, and an abundance of friendly stingrays who will glide up to you in the shallows. This remarkable behaviour began in the ’50s when commercial fishermen would clean their catch in the water, luring the stingrays in for a feed. While you’re there: Though visitors are not encouraged to feed nor pat the stingrays, you can observe their graceful nature by the remains of the bay’s historic jetty, circa 1900. The best time to view them is early morning or late afternoon. The rusting old bones of a sunken ship is one of the most intriguing places to explore in the ocean, particularly when the waters are this crystal-clear. However, the wrecks off Moreton Island were no accident: in 1963 recreational boat owners lobbied for a safe anchorage and the result was 15 ships being deliberately sunk, forever changing the seascape of this Queensland sand island (though, recently, the structures that once jutted out of the water have been cut down for safety issues). While you’re there: Pack your snorkel! Marine life including wobbegongs, trevally and kingfish yellowtail frequent the wrecks. They’re not too far from the shore either, so it’s easy enough to swim out and explore them yourself. Just three minutes west of Victoria’s most famous natural wonder, The Twelve Apostles, this lesser known coastal scene has us in awe. 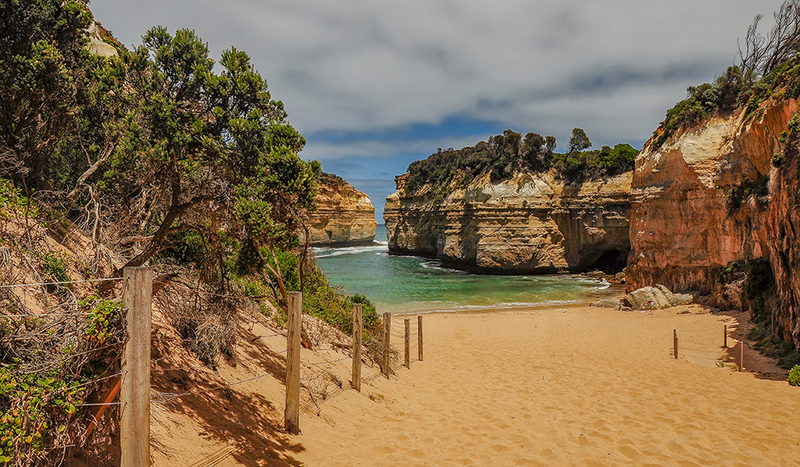 Part of Port Campbell National Park, the gorge is named after sailing clipper Loch Ard, which ran aground on nearby Muttonbird Island. Only two of the 54 passengers survived; the remaining pillars of a rock archway that crumbled in 2009 were named Tom and Eva after them. There are three easy walks in the area, with signs detailing its history, geology and natural features. While you’re there: from the viewing area overlooking the gorge, there are steps down to a small beach where you can take a dip and enjoy a different outlook of the cliff-faces from below. An hour south-east of Katherine is a remote little oasis of spring-fed thermal pools hidden within Elsey National Park. One of our favourites is Bitter Springs: fringed by tropical palms, the pool has striking water that sits at around 34ºC. Attracting abundant bird life, this tranquil spring is the ideal place to soothe muscles after exploring the park. While you’re there: If the water is too warm, you can walk a little further along to the cool and refreshing Stevie’s Hole. This is one epic swimming experience. Set among forest in the Top End’s Litchfield National Park, these twin waterfalls cascade into a delightful pool of crystal-clear water, perfect for swimming (with no crocs!). From the top, you have panoramic views over an open valley. While you’re there: You will need to walk down a 160-step staircase to get to the waterhole. Surrounded by leafy rainforest, it’s a tranquil spot to cool off from the tropical heat, with shady picnic areas nearby.